Gavin Cromwell has had a cracking beginning to the New Year with Raz De Maree, the champion horse fed by Bluegrass Horse Feeds, winning the Coral Welsh Grand National at Chepstow. Ridden by 16-year-old jockey, James Bowen, Raz de Maree proves he's not the retiring kind and has come out of the race in great spirits. Powered by Bluegrass, the gallant 13-year-old, which has been described by Cromwell as 'a gentleman of a horse', may now be considered for the Irish and English Grand Nationals as well as the Midlands version. The win at Chepstow places Raz De Maree as the oldest winner of the race in modern times. Cromwell, who's facilities are in Danestown, Co Meath, has been feeding his horses with Bluegrass Race Horse Cubes and Bluegrass Hi Performance Mix for over five years now. 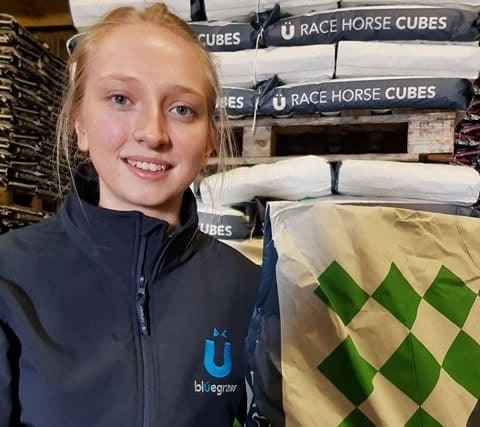 He said: "I am very happy with the feed we get from Bluegrass Horse Feeds which is supplied to us by Delany Performance Feeds LTD.
"It's important to get the basics right and make sure the horses are being fed to ensure best performance. "Our horses are in top form and are in great condition. Raz De Maree proved that at Chepstow and he was in great form after the race. He's a small horse but he's a great horse and, at 13-years-of age, this win means he's the oldest horse in modern times to win this race. That's a great thing to be able to say. "We are very proud of him. Raz De Maree is a pleasure to be around. He has great temperament. My little lad who is six rides him home from the gallops. "The horses need the right amount of power to compete so the feed is vital to that performance. So we are really pleased with the feed and look forward to the future." Kenneth Irwin, MD of Bluegrass Horse Feeds, said: "A huge congratulations to Gavin on this brilliant win with Raz De Maree. That congratulations is of course extended to his entire team and all connections involved in his recent winners. "We are delighted to supply Bluegrass Race Horse Cubes and Bluegrass Hi Performance Mix to Gavin. We wish Gavin and the team huge success in the future and we look forward to supporting them." * Bluegrass Horse Feeds is Supplied to Gavin Cromwell by Delany Performance Feeds LTD.